It’s National Adoption Month, a time when those of us “in the know” strive to bring attention to the over 130 million orphans around the world in need of a family. Though the month was first designated as a way to shine light on the nearly half a million children currently in our foster care system in the U.S., it has obviously become so much more than that–especially with Orphan Sunday tomorrow, when many churches around the world stand up and pray for orphans. The orphan crisis is definitely out of control, and there seems to be no end in sight. Currently, there are over 100,000 children waiting to be adopted out of the U.S. foster system. These are children whose parents have lost all rights to them. These are children who have been shipped from one foster home to another, gathering more emotional and physical baggage along the way, making them unwanted by the families who are looking for the perfect adoption situation. In my line of work, I am shocked by the number of people who want the perfect baby. They want a baby who looks like them, who has no physical disabilities, who hasn’t been exposed to drugs or alcohol, and who will just be a “normal” child. For those of you hoping to adopt, I hate to break this to you, but no adopted child will ever be “normal.” Even if they seem okay on the outside, these children are forever harmed by the loss of their biological family–even if that family was detrimental to their well-being. I know that this sounds foreign. Why wouldn’t a child want to be loved and provided for? Why wouldn’t they feel grateful that you took them in from that horrible life? That you rescued them? Why would they ever want to find a family who “gave them away”? Stop for a second and put yourself in their shoes. What child would ever choose to be an orphan? What child would ever appreciate being rejected? What child would ever want to have a piece of them missing? Yes, adoption is a beautiful example of the Gospel–God adopted us as His sons and daughters to receive the inheritance of His Son. He sent His own Son to die on the cross to redeem us from our sins. To redeem those who were under the law, so that we might receive adoption as sons. And because you are sons, God has sent the Spirit of his Son into our hearts, crying, “Abba! Father!” So you are no longer a slave, but a son, and if a son, then an heir through God (Gal. 4:5-7). But God’s original plan didn’t involve adoption. Sin didn’t factor in as part of the equation. A long time ago, God created perfect humans, who could fellowship freely with Him and not be afraid to see His face. They lived in perfect harmony with Him and were created to be like Him. It wasn’t until the first man and woman sinned that adoption was even needful. The brokenness of their relationship with God led to a breakdown in the natural family. No longer could they have that free fellowship with their Father. Now, they were stripped of their rights and cast out of their home. Therefore the LORD God sent him out from the garden of Eden to work the ground from which he was taken. He drove out the man, and at the east of the garden of Eden he placed the cherubim and a flaming sword that turned every way to guard the way to the tree of life (Gen. 3:23-24). Because of this, man and woman became in need of a Savior, One Who could redeem the lost sons and daughters to their Father. One Who could share His inheritance with His adopted brothers and sisters. One Who had not broken the relationship with His Father. So, when we expect children to be thankful that they are adopted, we are expecting them to be thankful for brokenness and sin. We are expecting them to carry emotions that we adults can’t even manage. Are we thankful for the brokenness that leaves us devoid of fellowship with our Heavenly Father? And when we DO receive adoption into His family, are we constantly thankful that He saved us from that brokenness? Or do we often fall back into our sinful ways to long for the things that are mediocre, that provide less than we need, that leave our lives lacking? We have a crisis on our hands. I see over 130 million children in need of a family, and I am overwhelmed by the reality that so many families refuse to open their homes and hearts to help these children because they are afraid of being uncomfortable. I am afraid that these children will never know what it is to be redeemed–to have a family provide for their needs, even when they don’t know what they need. To have a family love them even when they are being unlovely. To have a family give them the security to be able to feel all that they have lost. To have a family be their foundation–a light amidst life’s storms. If you want a perfect family, then adoption isn’t for you. Adoption is messy. It’s broken. There are people out there who are scamming adoptive families. There are agencies and lawyers and adoption advocates who are making money off of emotions. There are parents who are closed to accepting all that their children bring with them–even the baggage of having another family. If you want to provide love and security to a child in need, if you want to offer hope to a child who has no hope, if you want to love bigger than you ever imagined and welcome people from all walks of life into your home and heart, then you are ready to adopt. 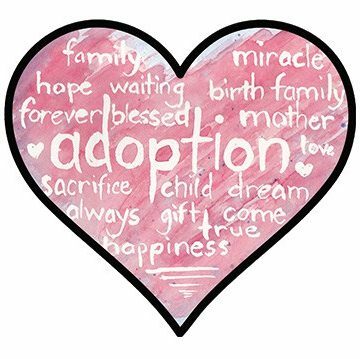 You are ready to experience the love and joy that adoption can bring. You are ready to intertwine your lives with another family, who may or may not want to be part of this child’s life journey with you. When we receive adoption from God, we are able to step out of our comfort zone and let that love flow into creating an unusual, unconventional, bigger-than-life family. We are able to have openness with our child’s biological family because our love is big enough to include them, too. We are able to love like no one else because WE have been loved like no one else. So this adoption month, do some research. Become familiar with adoptive and foster families in your church and neighborhood. Open your homes to these families. Adopt. Foster. Love big. Let the love that has been given so generously to you from your Heavenly Father flow over into loving others so well. You can change lives–one child at a time. We can solve this orphan crisis together.